ALL DRIVERS – Please read and understand the policy regarding Sending Photos in Messages. To stop receiving new quotes from a quote request please click on “Edit/Cancel” link in the message title or find the quote request in your Profile. To stop receiving all messages or email notifications go to Message Settings. The average price for a multi-day hire should be between 50 and 60USD per day for a normal sized vehicle. Be aware that drivers who quote less than this may try to make money by taking clients to tourist attractions where they earn commission or by using an old or very small vehicle. We do not recommend accepting a driver for less than 50USD per day unless there is a good reason. Confirm who your driver will be and what vehicle they will use. Will your driver be the person you are messaging, will it be the driver with reviews or will it be someone else. Check what the price includes and excludes. Are driver accommodation and food, toll fees, parking fees and insurance all included. If the driver says “fully inclusive” then no extra costs can be added. Check the payment terms and cancellation policy which can be different for each driver. Check the driver business listing to see photos of their vehicle(s). There is a link to the photos at the end of each message you receive. It is not recommended to accept any offer without seeing a photo of the vehicle. Confirm the total price and accept the quote before communicating privately off the site. After the total price is confirmed drivers on this site are not permitted to change the price. If they try this they will be removed. Also see Best Advice or try the Forums. Terms and Conditions: Please read our full Terms and Conditions before making a booking. These terms and conditions are written in a simple language so that you can understand them easily. Please take the time to understand them fully before making a booking on this website. 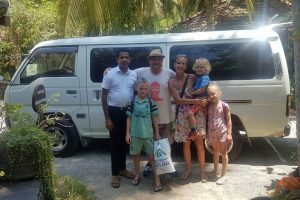 "This website", "us", "we" or "our" means the website “srilankacaranddriverhire.com”. "Service Hire" means the various different travel products and services that can be booked by you from the Service Providers on this website. "Service Provider" means the professional provider of car and driver services and travel experiences as advertised on this website. This website provides an online platform through which Service Providers can advertise and offer their products and services for hire. By booking a Service Hire, you enter into a direct (legally binding) contractual relationship with the Service Provider. From the point at which you book your Service Hire, we act solely as an intermediary between you and the Service Provider, transmitting the relevant details of your Service Hire to the relevant Service Provider(s). This website does not (re)sell, rent out, offer any (travel) product or service. When rendering a Service Hire, the information that we disclose is based on the information provided to us by the Service Providers. As such, the Service Providers that market and promote their services on this website are fully responsible for updating all images, licences, policies & conditions and other relevant information that are displayed on this website. We cannot guarantee that, all information is accurate, complete or correct, nor can we be held responsible for any errors, inaccurate, misleading or untrue information or non-delivery of information. Each Service Provider remains responsible at all times for the accuracy, completeness and correctness of the (descriptive) information displayed on this website. This website respects your privacy. Please have a look at our Privacy and Cookies Policy for further information. By making a Service Hire with a Service Provider, you accept and agree to the relevant cancellation policy of that Service Provider, and to any additional payment terms and conditions of the Service Provider. The relevant terms and conditions of a Service Provider are to be discussed and agreed before the Service Hire is booked. This website does not process any payments regarding Service Hires. We disclaim any liability or responsibility for any communication by or with the Service Provider on or through this website. You cannot derive any rights from any request to, or communication with the Service Provider or (any form of) acknowledgement of receipt of any communication or request. We cannot guarantee that any request or communication will be (duly and timely) received/read by, complied with, executed or accepted by the Service Provider. In order to duly complete and secure your Service Hire, you need to use your correct email address. We are not responsible or liable for (and have no obligation to verify) any wrong or misspelled email address or inaccurate or wrong (mobile) phone number. To the extent permitted by law we shall not be liable for (i) any punitive, special, indirect or consequential loss or damages, any loss of production, loss of profit, loss of revenue, loss of contract, loss of or damage to goodwill or reputation, loss of claim, (ii) any inaccuracy relating to the (descriptive) information of the Service Provider as made on our website, (iii) the services rendered or the products offered by the Service Provider, (iv) any (direct, indirect, consequential or punitive) damages, losses or costs suffered, incurred or paid by you, pursuant to, arising out of or in connection with the use, inability to use or delay of our website, or (v) any (personal) injury, death, property damage, or other (direct, indirect, special, consequential or punitive) damages, losses or costs suffered, incurred or paid by you, whether due to (legal) acts, errors, breaches, (gross) negligence, wilful misconduct, omissions, non-performance, misrepresentations, tort or strict liability by or (wholly or partly) attributable to the Service Provider whose products or service are (directly or indirectly) made available, offered or promoted on or through this website, including any (partial) cancellation, overbooking, strike, force majeure or any other event beyond our control. This website is not responsible (and disclaims any liability) for the use, validity, quality, suitability, fitness and due disclosure of the Service Hire and makes no representations, warranties or conditions of any kind in this respect, whether implied, statutory or otherwise, including any implied warranties of merchantability, title, non-infringement or fitness for a particular purpose. You acknowledge and agree that the relevant Service Provider is solely responsible and assumes all responsibility and liability in respect of the Service Hire (including any warranties and representations made by the Service Provider). We are not a (re)seller of the Service Hire. Complaints or claims in respect of the Service Hire are to be dealt with by the Service Provider. This website is not responsible for and disclaims any liability in respect of such complaints, claims and (product) liabilities.